1 of 4 Pierce potatoes several times with a fork and place in a microwave-safe baking dish. Microwave 8 to 10 minutes (depending on size), until flesh is soft. 2 of 4 Cool slightly, then scoop flesh into a pot with coconut milk and 1/4 tsp salt. Mix well over medium-low heat; cover to keep warm. 3 of 4 Combine Madras curry powder, 1/8 tsp salt and cayenne. Rub spices on flounder. 4 of 4 Place on a foil-lined nonstick baking sheet and bake at 375 degrees for 7 to 9 minutes, until cooked. 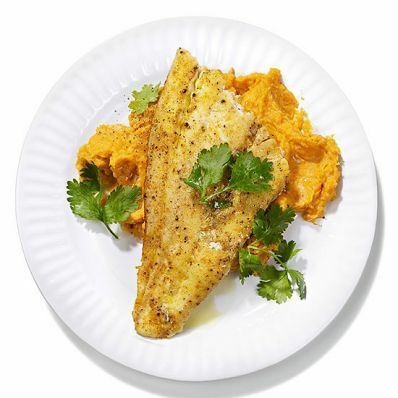 Serve over sweet potatoes and garnish with cilantro.